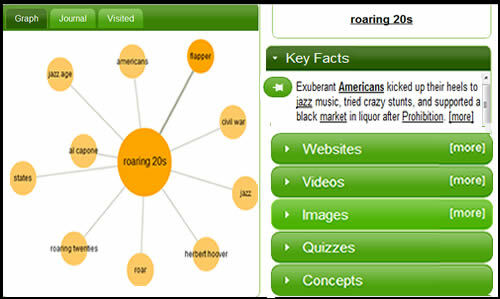 InstaGrok is an intelligent visual search engine and interactive learning tool that collects educational content and displays it in the form of a cloud of related words. 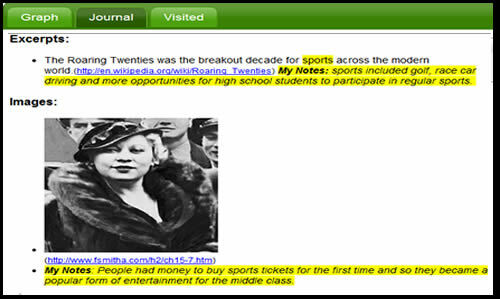 The tool is very appealing because it offers a variety of multimedia features to meet the unique learning needs of students. In addition to the visual map, content is displayed in the form of text, images, video and web links. Also, students can use the handy slider tool to access usable information by self selecting the level of difficulty of results displayed. Just enter a search term in the box to generate a word cloud and instaGrok collects an assortment of useful and related content that is categorized and displayed on the screen. As users sift the information they can use the push pin to add relevant content directly to the word cloud, allowing for the construction of a personalized web of knowledge about a concept. In addition to the the visual mode, an integrated journal and note-taking feature allows users to take notes without leaving the site. Click on the push pin to add content to the journal then add original thoughts and ideas as notes. Teachers should consider using the journal space for collecting citations too. The journal can be emailed or printed for convenience. As an added bonus for teachers, instaGrok displays auto-generated quizzes with every search to provide students with opportunities for self study. There is also a features that provides teachers with the ability to create classes and provide students with a code for logging in. Integrate it with Google Apps, allowing students to click a button, authenticate their login and save the information directly to their list of Docs. Add an EasyBib button so students can jump to EasyBib to easily create citations and store them all in one convenient spot. Many thanks to Grace at SimpleK12 for introducing me to this tool yesterday, what a great find!